Here I am in 1978 doing my best "PRE" imitation. I think I weighed about 132 lbs here. 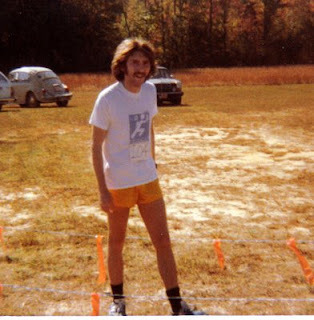 Anyway, as you may know from reading this blog, I started running 31 years ago. Well a couple of weeks ago, almost exactly 30 years after this photo was taken , I ran my 30,000th mile. Although I got hooked on the racing bug in 1978 I was never really a high mileage runner. A combination of factors kept the mileage down including long hours at work, my first son was born about 3 months after this picture and a few beginner injuries kept my average weekly miles around 35 a week for most of the late 70's and early 80's. 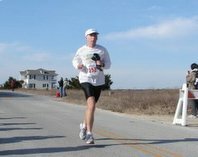 During the mid 90's I was hardly running and only recorded about 2 to 300 miles a year until after my torn acl in 1998 and I began my comeback. Amazingly over a 3rd of my mileage has come after I began ultrarunning in 2002 . At the beginning of 2003 I had only run about 19,500 miles. How long will it take to get the next 30,000?